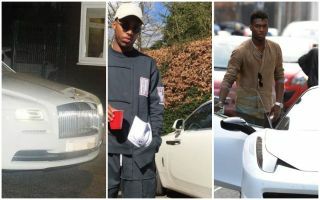 Daniel Sturridge has sadly seen his career blighted by injuries over the years, but the Liverpool striker hasn’t done too badly with his car collection. On his day and when fit, the England international has been devastating in front of goal, and it’s just a shame for fans in general that we haven’t been able to see more of that. Competition for places is also fierce at Anfield, and so it has undoubtedly been difficult for him. Nevertheless, as noted by The Sun, he appears to have done pretty well for himself off the pitch, as he boasts a very impressive car collection. Among the motors in his possession are said to be a £170,000 Ferrari 458, a Range Rover Evoque and a whopping £250,000 Rolls-Royce Wraith, as seen in the images below. It’s added in the report that the total value of his collection is said to be around £600,000, and that’s not all as he has previously shown off his Senturion Key which opens his supercars.